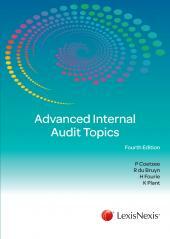 Advanced Internal Auditing Topics covers advanced audit topics such as Corporate Governance and has examples of exam questions. 2006 – Obtained the M Tech Internal Auditing from TUT. 1999 – Obtained the B Tech Internal Auditing from Technikon Pretoria (now TUT). 1982 to 1991 – State Auditor at the Office of the Auditor General (now AGSA).